Evening kids! Taco night is upon us, so I thought I would change it up a bit. So, you know those crunchy taco shells you are supposed to bake in your toaster oven or oven before you all all your ingredients? Well, most of the time, some of them get burned or not at all cooked through. I saw this idea on Pinterest and decided to add my own spin. Turned out great! The girls gobbled up their tacos. The awesome part about tacos is you can really add your own likes in that tiny shell. You could add a combo of black olives, black beans, refried beans, or ground beef. Mine are made with straight up cheese and ground beef. Make your ground beef. Drain and cool a bit. Put your shells in a long casserole dish. Put cheese on the bottom. 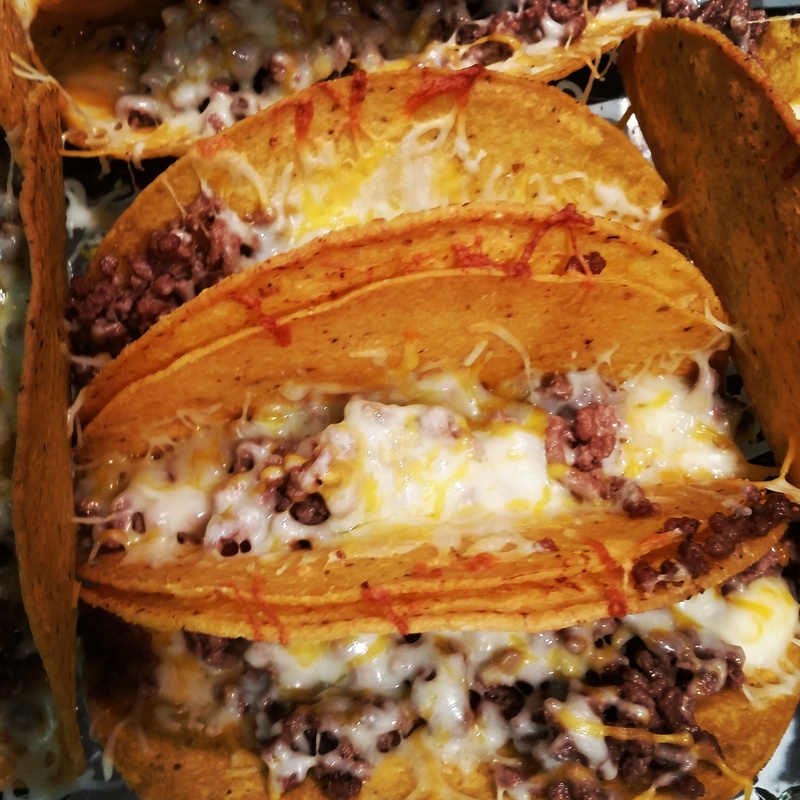 Add in a spoonful of beef to each taco. Top with more cheese. Bake for 15 minutes or so until shells turn golden brown and cheese is all melted. Add your favorite taco toppings. You could make a ton of these for a party and set out a taco bar! Sautee 1/2 a chopped onion and 2 cloves chopped garlic in a bit of oil in your hot pan. Take out the onions and brown a pound of meat. Once browned, take it out and strain it. Add it back in the pan with your onions and add your taco seasoning. Seasoning- Of course, you can always add more of less of these ingredients. I am using real sautéed onions and garlic, but you could use ground onion and garlic if you have it.